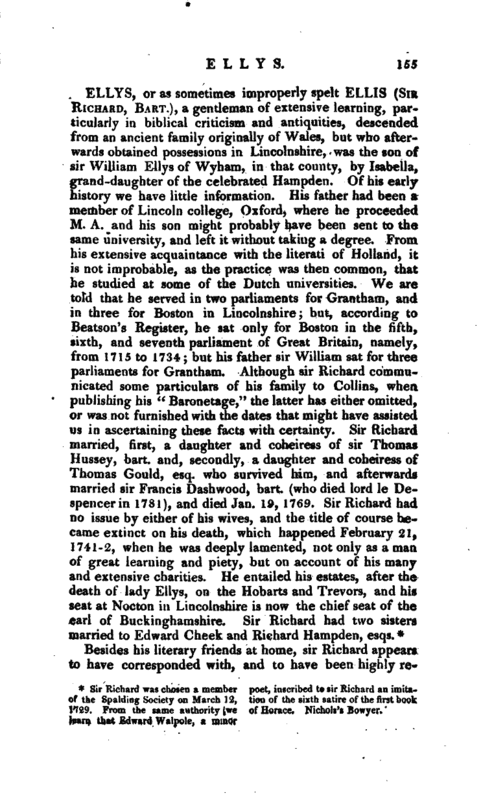 Sir Richard was chosen a member of the Spalding Society on March 12, 1729. From the same authority we learn that Edward Walpole, a minor poet, inscribed to sir Richard an imitation of the sixth satire of the first book of Horace. Nichols’s Bowyer. Among the transactions of the Spalding Society we find the following minute: “June 24, (1742), account of sir Richard Ellys’s library, and some curiosities lately come in there.”— Nichols’s Bowyer. The only work by which his merits as a scholar and critic can now be ascertained, was published at Rotterdam, in 1728, 8vo, under the title “Fortuita Sacra, quibus subjicitur Commentarius de Cymbalis.” The epithet fortuita is used as denoting that the explanation of the several passages in the New Testament, of which the volume partly consists, casually offered themselves. 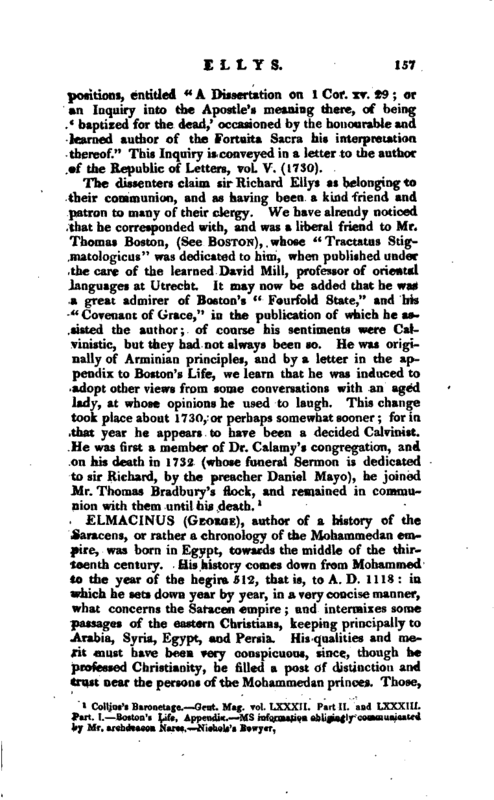 The whole indeed was written in the course of his private studies, and without any view to publication, until some friends, conceiving that they would form an acceptable present to the literary world, prevailed on him to allow a selection to be made, which was probably done by the anonymous editor of the volume; and they are written in Latin with a view to appear on the continent, where biblical criticism, although not perhaps at that lime more an object of curiosity than at home, required to be conveyed in a language common to the learned. 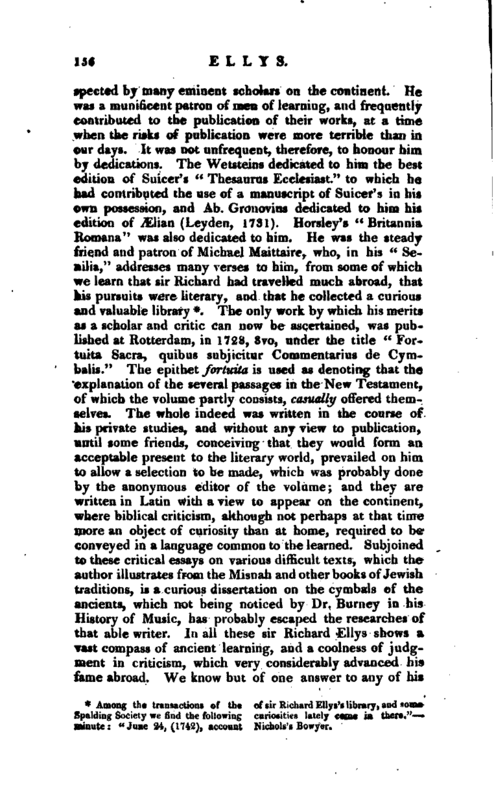 Subjoined to these critical essays on various difficult texts, which the author illustrates from the Misnah and other books of Jewish traditions, is a curious dissertation on the cymbals of the ancients, which not being noticed by Dr. Burney in his History of Music, has probably escaped the researches of that able writer. In all these sir Richard Ellys shows a vast compass of ancient learning, and a coolness of judgment in criticism, which very considerably advanced his fame abroad. We know but of one answer to any of his | positions, entitled “A Dissertation on 1 Cor. xv. 29; or an Inquiry into the Apostle’s meaning there, of being `baptized for the dead,‘ occasioned by the honourable and learned author of the Fortuita Sacra his interpretation thereof.” This Inquiry is conveyed in a letter to the author ef the Republic of Letters, vol. V. (1730).